Easter is a holiday that seems to be loved by many, Christians and non-Christians alike. It is a time for observing religious traditions or just traditions, such as egg hunting, Easter bunnies, and Easter parades. The traditional Easter foods may also vary based on geographical locations. And the dates for Easter can range so vastly depending on what calendar we speak of. In the world of Ostara and Paschal, Easter is enjoyed with an outing in meadows of green grass and outdoor sunshine. Meet Ostara, named after the German goddess by which the namesake Easter was derived. As lovely as she might be, she's far from a goddess. 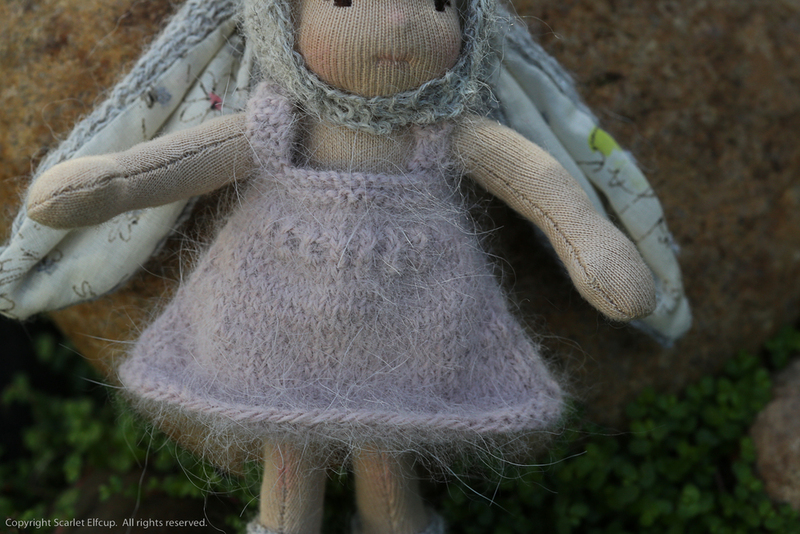 Ostara is a simple little girl who loves her family...her mum, her daddy, and her brother, Paschal. Ostara also loves animals, sunshine and green grass. She loves the simple pleasures such as painting, coloring, eating bananas, singing off-tune to herself, babbling all day long and watching Easter eggs come livelier with color. She's just 4 years old, Ostara....cute, sweet, innocent, lovely and playful. Like many 4-year olds, she also fusses when she's tired or hungry and she cries when she's upset or sometimes when things don't go her way. But, she's lovely all the same. Next, meet Paschal. Paschal is named after the latin term "pascha", meaning Passover as it relates to Easter. Paschal is Ostara's big brother. He too loves his family...his mum, his dad and his baby sister. Paschal also loves being outside in sunshine. He loves exploring and discovering the simple things of nature...picking up sticks and rocks and pine cones and bird feathers. He's not an adventurous spirit, just a curious one. Simple wonders like a walk in the meadow or a stroll with his animals makes his day a happy day. Paschal is a boy who absolutely loves animals. He is a nurturing and gentle boy. He has a small batch of baby chicks and two baby bunnies that he cares for. One of those bunnies actually belongs to Ostara, but she's too young to remember to feed it and take care of it, so Paschal does it for her. So, you might say he's father of 6 babies. It's a big job being parent. Babies require more than just love and kisses. Each day Paschal cleans out his animal babies' rooms making sure it is clean and comfy. He checks the room temperature and makes sure his baby chicks and baby bunnies are warm and adjusts the heating bulb if temps aren't just right. He makes sure they have enough water and food. He is even careful to watch his baby chickadees bums because little baby chickens are prone to "pasty bum", a condition of clogged bum pores caused by droppings that get stuck on the backside. This condition, if not taken care of will do great harm to the baby chicks. That's quite a big job for such a young boy. But, Paschal does it all and he does it all religiously. His favorite part of being a caregiver is playtime with his baby animals. Baby bunnies and baby chicks are active and curious. They need outside time to run, hop and jump. And Paschal loves to watch them. But, he is also quite vigilant, being careful never to turn an eye away for he wouldn't want any one of them to get themselves in a pickle. For Easter, Paschal and Ostara dressed in their best, put on their bunny and hare hats and took their baby animals for a walk in the meadow and for an exciting Easter egg hunt. Over in the meadow the baby bunnies hopped about in new growths of green grass, a sign that Spring is upon them. Ostara has a ball looking for tiny Easter eggs hidden among brilliant green blades of grass and so did one of the baby bunnies. Paschal, Mr. big and "harey", did nothing but mill around and never took an eye off his baby chicks for he was afraid one might get lost or eaten up by crows flying overhead. When all the excitement was over, Ostara and Paschal walked over to a dry creek and sat amongst the big boulders and counted their blessings....one, two, three, four, FIVE! beautiful Easter eggs for Ostara, four happy, healthy baby chicks for Paschal and two fluffy, bouncy baby bunnies, a mum, a daddy, a sister, a brother. Blessed are they, indeed! Ostara: Paschal, can we trade hats? Ostara: Paschal, I like your big, harey hat. Paschal: Me too, I like my big harey hat. I don't think your hat suits me, do you? Ostara: If you wore the hat correctly, maybe it would look better. You have it on upside down silly goose. Ostara is a Wee-Bee Mini Elfcup doll. She stands less than 6" (15 cm) tall. She is made with all natural materials. Her doll skin is made with premium quality cotton interlock imported from Europe. She is firmly stuffed with bio-wool made in Oregon. Her seams are sewn twice for reinforcement. Her locks are made of mohair yarn tied into two sweet pigtails. She has embroidered facial features. Her facial structure is sculpted giving her a sweet little face with an itty-bitty chin, round chubby cheeks and deeper set eyes. Her cheeks, nose and various body parts are blushed with red beeswax. She is a sitting doll with sewn joints that are made flexible for easy movement and changing of clothes. But, with some posing, she is also able to stand. She also has a belly button and a bum. Ostara comes wearing a sweet, soft rose colored handknit dress made from an angora, wool blended yarn by Rowan. Her bunny hat is hand knit with a 100% fine alpaca yarn and has a cotton floral fabric sewn into the inner ear. Her shoes are hand knit with a 100% fine alpaca yarn. Ostara comes bearing some hard found Easter eggs....five of them to be precise. Each tiny egg was carefully (for I was fearing for my fingers being jabbed by the swift sword of the felting needle) needle felted with 100% wool roving. Each of the eggs span an enormous length of 0.5 inches (1 cm) long and is the size of the tip of a finger. Ostara's Easter basket is handknit from a Japanese kakishibu dyed 100% silk fiber. Not to divert the topic here, but have I told you what a weak spot I have for Japanese fibers? If you have a fascination with natural dyed fibers as I do, you may appreciate reading this article about kakishibu dye by Chris Conrad. Chris is an expert fiber artist on the process of kakishibu dyeing and has published a book dedicated to this process called Kakishibu, Traditional Persimmon Dye of Japan. Now, back to Ostara...Not only does Ostara come with this delicate basket of eggs, but she along brings along her very own bunny, Lily. Lily is needle felted with 100% wool roving. Paschal is a Wee-Bee Mini Elfcup doll. He stands less than 6" (15 cm) tall. He is made with all natural materials. His doll skin is made with premium quality cotton interlock imported from Europe. He is firmly stuffed with bio-wool made in Oregon. His seams are sewn twice for reinforcement. His man-mane is made of mohair yarn. He has embroidered facial features and a classic Waldorf face with a simple and expressionless look. His cheeks, nose and various body parts are blushed with red beeswax. He is a sitting doll with sewn joints that are made flexible for easy movement and changing of clothes. But, with some posing, he is also able to stand. He has a belly button and a bum. Paschal comes wearing a simple gray and white striped cotton shirt under hand knit overall shorts. The overalls are made from an angora, wool blended yarn by Rowan. The pants have a tiny pocket made of a cotton fabric hand sewn onto the front. His big "harey" hat is hand knit with a 100% merino wool yarn and has a simple but beautiful Japanese cotton fabric sewn into the inner ear. His colorful orange shoes are hand knit with a 100% fine alpaca yarn. Paschal comes rolling along with his wagon-ful of four baby chicks. 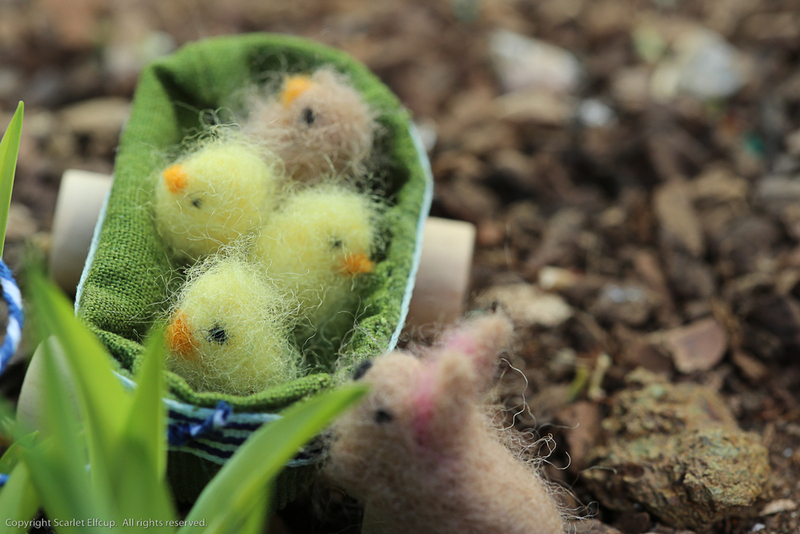 Each teeny-weeny baby chick was needle felted with 100% wool roving. As is common with baby chicks, these little itty-bitties are very delicate. Their bits of fluffy hair are so finely felted to their body and should not be handled roughly or they get squished. And you wouldn't want them squished. That would make Paschal very very upset and will break his heart. Each baby chick measures about 0.5 inches (1 cm) tall. 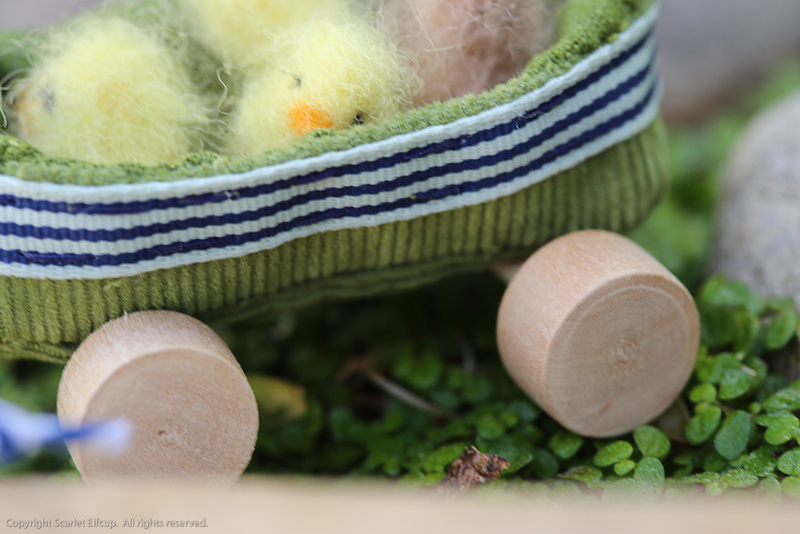 His wagon is hand sewn from corduroy (outer shell) and linen (inner shell) fabrics. The trim is made from cotton ribbon and the pull string is made from cotton twine. The wagon is sewn onto wooden wheels to make them totter along. Paschal also brings along his baby bunny, Buba. Buba is needle felted with 100% wool roving. Ostara and Paschal and their baby animals and personal belongings are recommended for ages 8+ due to the nature of their delicate design and the small parts on them that pose as choking hazards for young children. Ostara and Paschal....if you are interested in giving these two siblings a home they will be available individually in the shop tomorrow, Friday, February 27 at 9:00 PM (Pacific Standard Time). Thank you, have a lovely remainder of today.